Meir Indor, Chairman of the Almogor organization for terror victims castigates the decision to transfer terrorist’s bodies to the PA despite the High Court appeal. “The PA should invite the government and the High Court to the funerals, after the honor they gave the terrorists, making Shahids (martyrs) out of murderers,” said Indor. The IDF delivered the remains of Palestinian suicide bombers and other terrorists to representatives of the Palestinian Authority on Thursday. Israel’s repatriation of the bodies is part of a goodwill gesture to PA President Mahmoud Abbas. The Almagor terror victims association lashed out against Prime Minister Binyamin Netanyahu and Supreme Court President Asher Grunis for the decision to return the bodies. Almagor’s comments came after the High Court of Justice early on Thursday morning rejected a petition to publish the names of the 91 terrorists whose bodies were being released. Almagor filed the petition late on Wednesday night, just hours before the bodies were due to be returned to the PA. The petition argued that publishing a list of the terrorists’ names would give surviving terror victims and their families an opportunity to speak out about specific terrorists. The petitioners also expressed concern that the PA would use the releases as an opportunity to glorify the terrorists and terrorism. In rejecting the petition without passing it to a hearing before a panel of justices, Supreme Court Justice Yoram Danziger said Israel was releasing bodies and not prisoners who had not served their full sentences. Danziger also noted that Almagor filed the petition a very short time before the scheduled releases. On Thursday, Almagor called on the High Court to hold a hearing on the petition, and said it planned to ask Knesset to legislate to remedy what the terror victims association dubbed a “lack of legal status for victims of terrorist murderers, while the Palestinians have the right to build monuments to the murderers in Area A and B territories”. The terrorist bodies handed over include several suicide bombers who carried out the attacks on the No. 2 bus in Jerusalem’s Shmuel Hanavi neighborhood in August 2003 and at Cafe Hillel in the city’s German Colony neighborhood the next month. Israel also handed over the remains of Hassan Sarahneh, who blew himself up at a hitchhiking post in Ashkelon in 1996, killing a female soldier, and the remains of Nasim Ja’bari and Ahmed Qawassmeh, the two suicide bombers who killed 16 people on two buses in Beersheba in 2004. The list also includes Abdullah Badran, a suicide bomber who killed four Israelis at Tel Aviv’s Stage nightclub in 2005; Hiba Daraghmeh, the woman who blew herself up at a mall in Afula in 2003, killing three people; Hassan Abu Said, the Islamic Jihad terrorist who blew himself up at an open-air market in Hadera in 2005, killing five people; and Labib Azzam, who in 1995 murdered five Israelis and wounded 23 others in Ramat Gan. In addition, Israel handed over the remains of the terrorists who carried out the Savoy Hotel attack in Tel Aviv in 1975, killing eight hostages. The PA leadership is planning to honor the remains of Palestinian suicide bombers and other terrorists with full military funerals in Ramallah. Prisoners Affairs Minister Issa Qaraqi said Thursday that the PA would hold a “national rally” in the Mukata presidential compound in Ramallah in honor of the “martyrs.” Attending the rally will be Abbas, PLO leaders, and families of the Palestinians who perpetrated suicide bombings and other attacks over the past three decades. Qaraqi said that after the ceremony, the bodies would be sent to their hometowns, where each one would be buried in a military funeral. He said that 17 bodies whose hometowns were unknown would be buried in a Ramallah cemetery, also with full military honors. Another 12 bodies will be transferred for burial in the Gaza Strip, the minister said. Qaraqi called on Palestinians to consider Thursday a day of celebration for the return of the “martyrs” to their families. Israel released the bodies of 91 terrorists to the Palestinian Authority early Thursday morning, but refused to release their identities. Some of the bodies have been held by Israel for decades. Among those to be handed over to the PA are the remains of seven terrorists who attacked the Savoy Hotel in Tel Aviv in 1975, the terrorist who killed six people at Cafe Hillel in Jerusalem in 2003, and terrorists who bombed buses in Ashkelon in and Be’ersheva in 1996. However, the identities of the other terrorists have not been made public. The Almagor terror victims organization appealed to the Attorney General, demanding that the government reveal the names of the terrorists whose bodies are to be released. The request was denied, and Almagor appealed to the High Court late Wednesday demanding that the identities be revealed. No ruling has yet been made on that petition. The names that are known were revealed by the PA, not Israel. The bodies were removed from a military cemetery in the Jordan Valley Thursday morning and taken to Ramallah, from where they will be dispatched to cemeteries in PA controlled areas of Judea and Samaria, and in Gaza. The PA intends to hold “honor ceremonies” and funerals for the terrorists, most of whom are considered “heroes” among PA Arabs. The remains of 79 Palestinian terrorists arrived in the West Bank city of Ramallah Thursday morning as the bodies of 12 more made their way to the Gaza Strip. 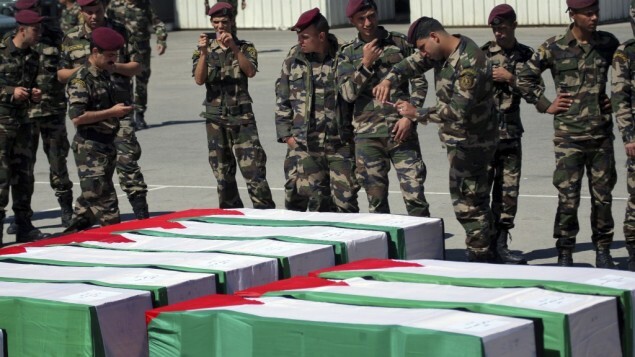 The remains were transported in two truck convoys from the cemetery for fallen enemy individuals, in the Jordan Valley, to their destinations in the Palestinian Authority. The Palestinian official in charge of Thursday’s transfer, Salem Khileh, said Israeli officials handed over the bodies to Palestinian liaisons in the Jordan Valley. The transfer of the bodies, in an operation titled “Crossing Jordan,” went ahead despite petitions by families of terror victims to the High Court of Justice late Wednesday evening. According to media reports, a convoy of six trucks transferred the remains of 79 terrorists to Ramallah, while two additional trucks brought the remains of 12 terrorists to the Erez Crossing with Gaza. Among the 91 bodies are the remains of a suicide bomber who killed seven Israelis at Cafe Hillel in Jerusalem; a terrorist who blew up the Jerusalem No. 2 bus, killing 18; and two suicide bombers who killed 16 Israelis in Beersheba. The bodies of seven Fatah terrorists who took over the Savoy Hotel in Tel Aviv in 1975 and were killed in a Sayeret Matkal rescue operation were also returned on Thursday. The return of the bodies of 130 terrorists is regarded as a confidence-building gesture aimed at reviving direct negotiations between Israel and the Palestinians. The remainder of the bodies will be transferred to the Palestinian Authority on an unspecified date. “We hope that this humanitarian gesture will serve both as a confidence-building measure and help get the peace process back on track,” Israeli government spokesman Mark Regev said. “Israel is ready for the immediate resumption of peace talks without any preconditions whatsoever,” Regev added. Near the crossing from Israel to Gaza, families held framed pictures of their dead sons as they awaited the bodies. Ahmad Kahlout’s 21-year-old son Yehiya was killed 17 years ago after he raided an Israeli settlement. In Gaza, dozens of Islamic Jihad fighters and families holding framed pictures of their dead relatives welcomed the 12 coffins as they entered from Israel, draped with Palestinian national flags that were then presented to families. Women ululated and threw rice and sugar over the coffins. Hamas police officers fired 21 shots into the air in salute. Thousands spilled into Gaza’s streets for the funeral procession, many stopping to mark a moment of silence. Islamic Jihad fighters armed with machine guns and hand grenades wore white robes and masks — clothes meant to symbolize the martyrdom of the suicide bombers. PA President Mahmoud Abbas and the Palestinian leadership attended a noon ceremony at the Muqata’a compound in Ramallah honoring the reception of the terrorists’ remains. Following the service, the remains will be dispersed to various Palestinian cities for burial. Abbas has given no sign that the gesture would persuade him to return to talks. On Wednesday, he reiterated that the Palestinians would not return to negotiations unless Israel freezes all settlement construction in the West Bank and east Jerusalem. Palestinians see those areas, captured by Israel in 1967, as the core of a future state that would also include Gaza. Israel rejects that demand. Israeli-Palestinian talks stalled more than three years ago and have failed to take off again despite US mediation, primarily because of the dispute over settlement construction. Israel began transporting the remains of 91 terrorists to the Palestinian Authority Thursday morning, as part of a good will gesture by Prime Minister Benjamin Netanyahu to Palestinian President Mahmoud Abbas. Operation “Crossing Jordan” will see the remains of 91 terrorists, responsible for murdering hundreds of Israelis, transferred to the West Bank and Gaza Strip. 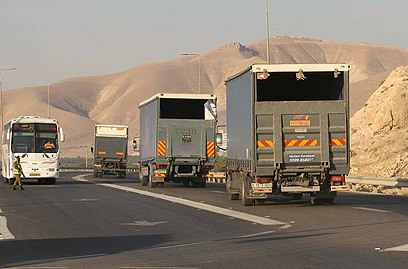 A convoy of six trucks will transfer the remains of 79 terrorists to Ramallah, while two additional trucks will travel to Erez crossing, with the remains of 12 terrorists. GOC Central Command’s Chief Rabbi Lt.-Colonel Yoav Oknin will oversee the operation. The operation was launched in early May, when the IDF Rabbinate began exhuming and verifying the identities of the remains, buried in the enemy combatants’ cemetery in the Jordan Valley. The IDF Rabbinate drafted dozens of its reserve soldiers to assist in the operation, which was conducted under a closed military zone order, as well as a media embargo. The Palestinian Authority is planning an official ceremony to mark the remains “homecoming” at the Mukataa in Ramallah, with President Abbas and top Palestinian officials in attendance. Following the service, the remains will be shuttled to the various Palestinian cities for burial. Hamas government in Gaza is planning a full military service for the remains. Members of all Palestinian factions are expected to attend. The remains of each terrorist will receive a 21-gun solute. The Almagor Terror Victims Association, which objected to the move, said it will petition the High Court to order the government to release the full list of terrorists included in the deal. “The victims’ families and the Israeli public deserve to be made aware of facts that the Palestinian public already knows,” the group said in a statement. The families of terror victims appealed to the High Court of Justice late Wednesday evening to delay the overnight transfer of the remains of 91 terrorists to the Palestinian Authority. The remains will be handed over to the PA before Thursday morning, Attorney General Yehuda Weinstein said. The Almagor Terror Victims Association, however, wants the families of terrorist victims to get the chance to appeal the government’s decision. It also wants the government to pressure the PA to refrain from celebrations honoring the terrorists. PA President Mahmoud Abbas and the Palestinian leadership are expected to attend a ceremony at the Muqata’a compound in Ramallah honoring the reception of the terrorists’ remains, Palestinian Civil Affairs Minister Hussein a-Sheikh said. The Justice Ministry said the names of the terrorists whose remains will be given to the PA on Thursday had been handed over to the families of the victims on Wednesday evening. “The Palestinian Authority knows the names, the families of the killers know the names — only the families of the victims and the Israeli public are not exposed to the facts”, the organization said. Earlier on Wednesday, a Palestinian minister claimed that several terrorists who had murdered Israelis were among those whose remains were to be transferred. Among the 91 bodies, according to earlier reports, are the remains of a suicide bomber who killed seven Israelis at Cafe Hillel in Jerusalem; a terrorist who blew up theJerusalem No. 2 bus killing 18; and two suicide bombers who killed 16 Israelis in Beersheba. The bodies of seven Fatah terrorists who took over the Savoy Hotel in Tel Aviv in 1975 and were killed in a Sayeret Matkal rescue operation will also be returned on Thursday. Almagor said that it would file a petition with the High Court later Wednesday night demanding that the names of the dead terrorists to be handed over to the PA be revealed immediately. NGO files motion asking court to force state to act to save Mohammed Abu Shahala, who brokered Machpela House sale. Almagor, an NGO representing terror victims, has filed a motion to the High Court asking it to compel the state to take action for cancellation of a Palestinian Authority (PA) death sentence against an Arab who helped Jews buy a house in Hevron. The man, Mohammed Abu Shahala, was the go-between in the deal in which Jews bought a structure within Hevron, near the Cave of Machpela. The Jewish residents were forcibly evicted from the building, which had been named Beit HaMachpela, a short time after entering it, following Defense Minister Ehud Barak’s pronouncement that by living there they were creating a security problem for the IDF. Attorney Naftali Wurtzberger, who represents Almagor in the motion, told Arutz Sheva that it is based on undenied news reports that a PA court sentenced Abu Shahala to death, in accordance with a PA law that makes selling land to Jews a capital crime. Wurtzberger said that Almagor has asked the Attorney General and Legal Advisor to the Government, Yehuda Weinstein, to take action in order have the sentence cancelled and to also cancel the legislation it was based upon. The AG’s replies were fuzzy, he said, and gave the feeling that Israel was dragging its feet on the matter. The European Union said last week that it has interceded on Abu Shahala’s behalf. According to right wing organization Almagor, the IDF Rabbinate is currently unearthing the remains of terrorists in order to return them to the PA as a show of good will. The organization demands to prevent the transfer, as the PA will take advantage of the remains and laud more terrorist activity against Israel. Hamas’s spokesman in Gaza’s Khan Younis Hammad al-Ruqab called on Tuesday on Palestinians to kidnap Israeli soldiers to use as bargaining chips in prisoner exchanges, the Palestinian Ma’an news agency reported. In October, Israel released 1,027 Palestinian prisoners in exchange for kidnapped Israeli soldier Gilad Schalit. On Monday, Israel and Palestinian security prisoners signed an Egyptian-mediated deal to end a 28-day hunger strike by inmates. Speaking to Israel Radio, Danon said: “We will end up paying for this mistake,” and added that the deal was “not worth the paper it is written on.” Danon also condemned Israel for maintaining luxurious conditions for prison inmates, likening the jail system to a kindergarten. MK Isaac Herzog (Labor) also condemned the deal, saying that it served only to strengthen Hamas. The Almagor Terror Victims Association also criticized the agreements, saying that Israel gave in to terrorists’ demands and threatening legal action against the government. In a press release, the organization’s director Meir Indor said that the deal reflected that both the government and the Israel Prison Services are weak. Indor condemned the government for agreeing to release the bodies of terrorist, which he said will be used by the PA to create rallying points for terror. Indor also stated that the deal was setting a dangerous precedent, as it is the first time that Israel has signed an agreement with terrorist prisoners in Israeli jails and is also the first time a foreign entity (Egypt) has been able to intervene in internal Israeli affairs. The Egyptian-mediated agreement to end the weeks-long hunger strike of Palestinian prisoners was a mistake, Likud MK Danny Danon told Israel Radio on Tuesday morning. The deal, announced on Monday, grants better conditions, including family visits, to prisoners held under administrative detention. Part of the deal includes modification of Israel’s administrative detention policy as well. In return, the prisoners agreed to sign a pledge renouncing terrorism, a controversial stipulation that critics say is nonbinding. Danon plans to bring the matter up before the Knesset Foreign Affairs and Defense Committee in an attempt to block implementation of the deal, according to a report by Arutz Sheva. Danon also said that just as Israel would not grant a Hezbollah member held in an Israeli jail family visits, similarly members of Hamas should not be able to receive visitors either, as both groups deny the existence of Israel. The Almagor Terror Victims Association also came out against the agreement on Tuesday, saying in an official statement that it set a dangerous precedent as it was the first time the government had signed a deal with imprisoned terrorists. The group also slammed the involvement of Egyptian mediators in internal Israeli affairs. The Almagor umbrella group of terror-victim organizations said, Tuesday, that it was considering court action to block the return of 100 terrorist bodies to the Palestinian Authority, announced Monday evening. In spite of denials by Prime Minister Binyamin Netanyahu, who called the move a humanitarian gesture, the group called the action trafficking and commercialization of bodies which will result in the glorification of terrorists at their funerals. It called withholding their bodies a deterrent. Almagor also criticized the state’s deal to stop a hunger strike that had been described, until Monday, as pertaining to administrative detainess, only for it to be revealed that it also involved convicted terrorists. The group said the agreement set a number of dangerous precedents, including an essential victory for the hunger strikers and Egypt’s involvement.